This study compares the 2008 prices of prescription generic drug products in Canada to prices in other industrialized countries. It also estimates the potential savings that might be realized by public drug reimbursement programs if Canadian generic prices were brought into line with foreign prices. Price comparisons are given for seven comparator countries: France, Germany, Italy, Sweden, Switzerland, the UK and the US. The study provides both bilateral and multilateral average price ratios. Prices used for this purpose represent pharmacy acquisition costs and are derived from sales data contained in IMS Health's MIDAS database. Foreign prices of leading generic drugs were typically lower than corresponding Canadian prices in 2008. Switzerland was the only exception. Average price ratios obtained for all other comparator countries were well below parity, ranging from 42% (Sweden) to 73% (France) of Canadian prices on average. Multilateral comparisons tell a similar story: foreign mean and median prices were, on average, 29% and 37% less than corresponding Canadian prices. These price differentials were broadly based and were even more pronounced among top-selling generic drugs. The public reimbursement programs considered here would have saved a total of $533.2 million (32% of actual drug cost) in 2008 had they reimbursed at the foreign mean and would have saved $675.2 million (40% of actual drug cost) had they reimbursed at the foreign median. Every program could have saved at least a quarter of its 2008 drug costs had it reimbursed at foreign mean prices and at least a third of its costs had it reimbursed at foreign median prices. Based on the 2008 data, potential cost savings of 40–50% seem quite feasible. This study compares the 2008 prices of prescription generic drug products in Canada to those in other industrialized countries. It also estimates the potential savings that might be realized by provincial drug reimbursement programs if Canadian generic prices were brought into line with those observed in the comparator countries. The price comparisons presented in this study are given for seven comparator countries: France, Germany, Italy, Sweden, Switzerland, the UK and the US. These are the seven countries that the PMPRB considers in reviewing the prices of patented drug products and in reporting on trends in Canada's patented drug sector. This study examines foreign-to-Canadian generic drug price differentials for the 2008 calendar year. Note that these differentials can vary significantly from one year to another due to changes in the exchange rates. Since 2008, some public drug plans (such as Ontario, British Columbia, Alberta and Quebec) have implemented major reforms to generic drug pricing. This study depicts the foreign-to-Canadian generic price differentials before these price reductions were applied. However, at the time of the publication of this study, most public and private drug plans in all the other provinces were still reimbursing at about the same level as in 2008. The analysis reported is still relevant for these programs. For the purpose of this study, the term “drug” signifies a unique combination of active ingredient(s), form and strength(s). Note that this definition does not involve the identity of the manufacturer: all references to a drug's sales or price signify an aggregate or average taken across all generic versions of the drug on the market in 2008. The term “drug product” refers to the version of a drug sold by a particular supplier. The term “molecule” refers to the principal active ingredient(s) of the drug in question. Note that several drugs may be associated with a given molecule. This section presents a series of average foreign-to-Canadian price ratios for 2008. A large sample of 105 leading (top-selling) molecules, encompassing 460 drugs, was used to conduct international price comparisons. (For a complete list of these molecules, see Appendix 2.) To be consistent with previously published PMPRB studies, the analysis was restricted to drugs for which there were at least two generic versions of the drug sold in Canada in 2008. Both bilateral and multilateral average price ratios are presented. Each bilateral ratio provides a head-to-head comparison of prices in a particular comparator country to prices in Canada. Multilateral ratios involve price measures reflecting all foreign prices available for individual drugs. The multilateral measures considered here are the mean, median, minimum and maximum of foreign prices. To ensure that the multilateral results would not be dominated by any single comparator country, multilateral price ratios were calculated only when prices were available in least three comparator countries. Step 1. Physical quantities sold and the corresponding monetary value of sales were summed across all generic versions of each drug available in a particular country in 2008. Step 2. The total monetary value of sales was divided by the total physical quantity sold by drug and country. Step 3. Foreign prices were converted to their Canadian dollar equivalents using the average annual market spot exchange rates obtained from the Bank of Canada. Step 1. Foreign prices were examined by drug to produce the various multilateral foreign price comparators. Step 2. Whenever a foreign price comparator was available, a foreign-to-Canadian price ratio was calculated. Step 3. The price ratios obtained in Step 2 were then aggregated for each price comparator by taking an arithmetic weighted-average of all foreign-to-Canadian price ratios available for the foreign price comparator in question. The weight applied to each drug in this calculation was proportional to its share of total 2008 generic drug sales in Canada (and equal to its share of sales among the generic products encompassed by the average ratio). Table 1 provides average bilateral foreign-to-Canadian price ratios, as well the number of molecules and share of 2008 Canadian generic drug sales encompassed by each ratio. For example, the results indicate that French prices for generic drug products were, on average, 73% of corresponding Canadian prices in 2008. This ratio encompassed 82 molecules that accounted for 43% of 2008 generic drug sales in Canada. The results in Table 1 indicate that foreign generic prices were typically lower than corresponding Canadian prices in 2008. Switzerland was the only exception.2 All other average price ratios were well below parity, ranging from 42% (Sweden) to 73% (France) of Canadian prices. Figure 1 provides additional information on the individual foreign-mean- and foreign-median-to- Canadian price ratios underlying the averages reported in Table 2. Each point in this figure represents an individual price ratio. Drugs are ranked (highest to lowest) along the horizontal axis according to their 2008 Canadian sales. The scatter plots in Figure 1 confirm that the results reported in Table 2 are broadly based, with the majority of individual price ratios being appreciably below parity. Closer inspection reveals that most drug-level ratios are clustered within a fairly narrow band centered on the averages reported in Table 2. These results affirm that generic drugs normally cost less in foreign markets than in Canada. Switzerland again was the only exception, with 6 of 10 Swiss-to- Canadian price ratios exceeding parity. In most other cases, foreign prices for these leading molecules were much less than (and, in many instances, less than half of ) their Canadian prices. The last row in Table 3 provides average price ratios encompassing all topselling molecules: in all instances these ratios are less than their corresponding values in Table 1, indicating that foreign-to-Canadian price differentials were even more pronounced among these top-selling generics. 1 It is important to recognize that MIDAS data are based on invoiced prices and do not include off-invoice discounts, free goods and other forms of price reduction such as rebates offered by manufacturers to retailers. 2 In an earlier study, the PMPRB reported a Swiss-to-Canadian price average ratio of 0.74 for 2007. (See PMPRB: Generic Drugs in Canada: Price Trends and International Price Comparisons, 2007, available at http://www.pmprb-cepmb.gc.ca.) This result was based on ex-factory prices rather than pharmacy acquisition costs, which appears to be of considerable importance in the case of Swiss-to-Canadian price comparisons. (See Table A1.1 of Appendix 1.) It also reflects the substantial depreciation of the Canadian dollar against the Swiss franc that occurred between 2007 and 2008. 3 Each molecule listed in Table 3 encompasses several drugs (as previously defined). The reported ratios are sales-weighted averages of individual foreign-to-Canadian price ratios taken across the various drugs (i.e., strengths and forms) associated with each molecule. While the previous section analyzes Canada-wide pharmacy acquisition costs, this section estimates the savings that public drug reimbursement programs might realize if Canadian generic prices were brought into line with foreign prices. The analysis comprises eight provincial programs— British Columbia, Alberta, Saskatchewan, Manitoba, Ontario, New Brunswick, Nova Scotia, Prince Edward Island—and a federal program—the Non-Insured Health Benefit (NIHB) program. Potential cost savings were estimated by recalculating program drug costs at median or mean foreign prices, and then taking the differences between the hypothetical costs and the historical program costs. These calculations were performed at the individualdrug level and then aggregated. The public drug plan costs referred to in this section are reimbursements exclusive of professional fees and pharmacy mark-ups and do not reflect off-invoice discounts, free goods and other forms of price reduction such as rebates. These costs include both the amount that the drug plan paid and the amount that beneficiaries paid according to the specific jurisdiction's deductible-copayment structure. All reimbursement data were either taken from the NPDUIS database or supplied directly to the PMPRB by public drug programs. Generic drugs accounted for a substantial portion of total program costs. Figure 2 provides estimates of the generic share of total costs for public reimbursement programs in the fiscal year 2008/09. Generic drugs accounted for 28.2% of the combined costs of all of the programs. Shares ranged from a low of 25.6% in Ontario to a high of 37.1% in PEI. These variations may reflect differences in the cost of generic drugs reimbursed, drug coverage, demographics and therapeutic mix. The previous section on International Price Comparisons reported that foreign mean and median prices were, respectively, 29% and 37% less than corresponding Canadian prices, on average, in 2008. These results reflected the pattern of sales across the entire Canadian generic market. However, top-selling generic drugs such ramipril, simvastatin and omeprazole, which have much lower prices in foreign markets than in Canada (Table 3), are used more in public reimbursement programs than in the aggregate Canadian market. As a result, foreign-to-Canadian price differentials have a more pronounced effect on the cost of these programs than is suggested by the average ratios of Table 2.
public reimbursement programs than in the aggregate Canadian market. As a result, foreign-to-Canadian price differentials have a more pronounced effect on the cost of these programs than is suggested by the average ratios of Table 2. Figure 3 illustrates this effect. This figure provides program-specific average foreign-to-Canadian price ratios, each ratio reflecting patterns of reimbursement in the program to which it applies. Although all public programs reimburse close to the pharmacy purchase price, the aggregated results indicate that foreign mean and median prices were 32% and 40% less, on average, than reimbursed prices. Even larger differentials were obtained for most individual programs. Table 4 provides estimates of the cost savings that public reimbursement programs might realize if Canadian prices for generic drugs were brought in line with those in other countries. Column A of this table gives actual 2008 drug costs incurred by the various programs in reimbursing the generic drugs considered in this analysis. Columns B and E provide estimates of what drug costs would have been had programs reimbursed at foreign mean and median prices, respectively. Columns C and F give the corresponding potential cost savings in millions of dollars, while Columns D and G restate these cost savings as proportions of the actual drug costs listed in Column A. Not surprisingly, the results in Table 4 indicate that potential cost savings are substantial. Collectively, programs would have saved $533.2 million (32% of actual drug costs) had they reimbursed at the foreign mean, and would have saved $675.2 million (40% of actual drug cost) had they reimbursed at the foreign median. Every program could have saved at least a quarter of its 2008 drug costs had it reimbursed at foreign mean prices, and at least a third of its costs at foreign median prices. For most programs, potential cost savings of 40–50% seem quite feasible. 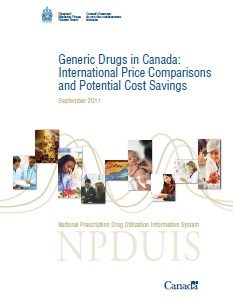 This study (1) compares 2008 prices of prescription generic drug products in Canada to those in other industrialized countries, and (2) provides estimates of the potential savings that might be realized by public drug reimbursement programs if Canadian generic prices were brought into line foreign prices. Foreign prices of leading generic drugs were typically lower than corresponding Canadian prices in 2008. Switzerland was the only foreign comparator with prices that were, on average, higher than Canadian prices. Average price ratios obtained for all other comparator countries were well below parity, ranging from 42% (Sweden) to 73% (France) of Canadian prices, on average. Multilateral comparisons tell a similar story: foreign mean and median prices were on average 29% and 37% less than corresponding Canadian prices. These price differentials were broadly based and even more pronounced among top-selling generic drugs. Potential cost savings are substantial. Taken together, the public reimbursement programs considered here would have saved $533.2 million (32% of actual drug cost) in 2008 had they reimbursed at the foreign mean and $675.2 million (40% of actual drug cost) had they reimbursed at the foreign median. Every program could have saved at least a quarter of its 2008 drug costs had it reimbursed at foreign mean prices, and at least a third of its costs had it reimbursed at foreign median prices. For most programs, cost savings of 40–50% seem quite feasible. The average foreign-to-Canadian price ratios provided in the main body of the report were based on sales by wholesalers and manufacturers to pharmacies, and represent pharmacy acquisition costs. Tables A1.1 and A1.2 provide average foreign-to-Canadian price ratios based on ex-factory prices (i.e., net of any wholesale and retail markups) and retail prices (that is, prices paid by consumers or national reimbursement programs). These results are, again, sales-weighted arithmetic averages of individual foreign-to-Canadian price ratios. The results obtained with ex-factory and retail prices are consistent with those obtained using pharmacy acquisition costs. In particular, with the exception of Switzerland, the bilateral comparisons indicate that foreign prices for generic drugs are substantially less than those in Canada. Note that even the average Swiss-to-Canadian price ratio falls below parity when ex-factory prices are used rather than pharmacy acquisition costs. Note as well that the average foreign-mean- and foreign-median-to-Canadian price ratios are remarkably robust with respect the choice of the price measure.